Investing in infrastructure is a good idea to grow any economy. The North has the largest infrastructure deficit in the country. Lack of infrastructure is holding back economic development. Historically, the federal government invested in infrastructure for mining development. Mining then helped pay off that infrastructure. When mining finished, the infrastructure remained adding to industry’s positive public legacy. Examples include Snare hydro power for Yellowknife and its mines, the Taltson and Bluefish hydropower plants, the Great Slave Lake railway for the Pine Point mine, roads to resources to mining towns of Yellowknife and Pine Point, marine shipping and ports including the world’s first ice-breaking cargo ship, the MV Arctic for the Polaris and Nanisivik mines in Nunavut. By supporting and enabling mines and their economic contributions, government recouped their infrastructure investment. As a bonus, that legacy infrastructure is still serving the North and Canada. After a 40-year infrastructure investment gap, two transportation projects were recently announced. These include the Tlicho All Season Road and funding to advance the Mackenzie Valley Highway. Investment in the Slave Geological Province and the Grays Bay Road and Port project remain important projects which would improve access to mineral deposits considered uneconomic due to lack of access. Another opportunity is reducing power costs. Power is a significant cost to both remote communities and mines, and substitution of fossil fuels is not always feasible. The NWT 2030 Energy Strategy includes a vision to expand the Taltson hydropower system to connect the North and South Slave electricity systems, link them to southern Canada, and supply communities and mines with cheaper, renewable, and green power. 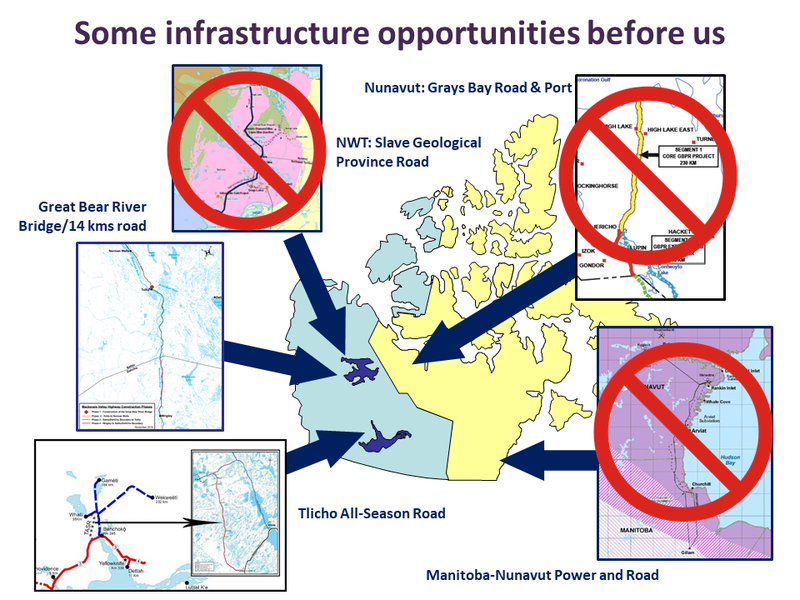 Not only would this reduce green-house gas emissions, but cheaper grid power north and south of Great Slave Lake would reduce community cost of living, could help push the Pine Point mine into re-opening, and would sustain and grow mining in the mineral rich Slave Geological Province.